But it was time to move on. We were down from twenty to three days of food, and while it definitely meant a lighter load for the remaining portages, it was also a sign that our trip was almost done. We were about 27 kilometers from the take-out point at the Bear Camp on river right of the Pikitigushi just above the logging road bridge. We had originally arranged for a shuttle back to our vehicle at the Mattice Lake headquarters of Mattice Lake Outfitters from there on Thursday. However, a couple of emails sent via my Spot Connect from Cliff Lake had requested that the pick-up happen a day early. It was Tuesday and we now had a day and a half to knock off the last 27 kilometers! portages: 4 – 90 m; 525 m; 300 m.; 265 m.; 150 m. See maps below. 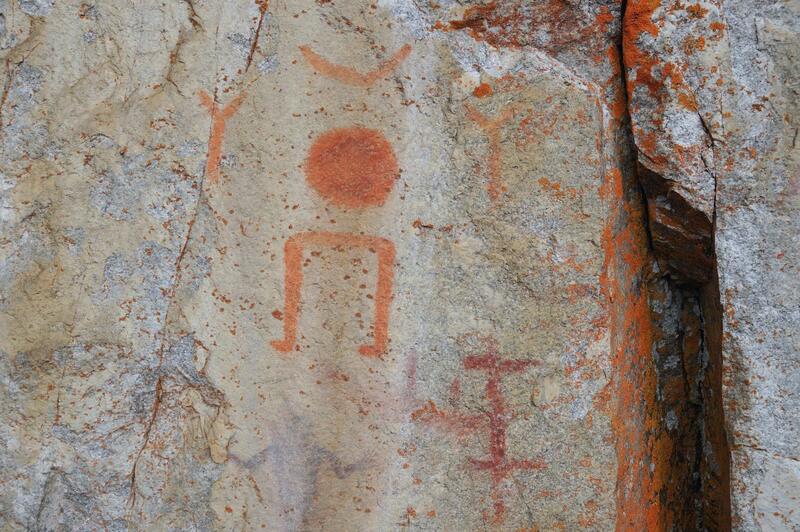 At the south end of Cliff Lake, just across from the best-preserved collection of pictographs on the lake, we left Wabakimi Provincial Park and entered Whitesand Provincial Park. (The stretch from Bad Medicine Lake down to the north shore of Pikitigushi Lake is all within the boundaries of Whitesand P.P.) We also dealt with the first of the five or six portages on this section of the Pikitigushi. Over the next couple of days, we’d do another four, with the 1400-meter haul from Derraugh Lake to Pikitigushi Lake as the longest and mushiest. It is undoubtedly an easier portage if you are coming at it from the north. What we found was a 525-meter trail that starts off rather steeply but dry. After a dramatic middle stretch where you are walking on a ridge just a few meters from the edge of the gorge, the trail takes you to a challenging and winding descent to the lake itself. The last few meters involves an almost vertical drop to the shore. Here is a shot – I should have stepped back a few more feet to get the complete drop in – but it’ll give you an idea of what it looks like. We actually had lunch at the top of the final drop. A bit more time and we might have tried walking up the river through the mess of bush you see in the pic below in search of a photo that would show some of the 20-meter drop in elevation from Cliff Lake to where our canoe was sitting. 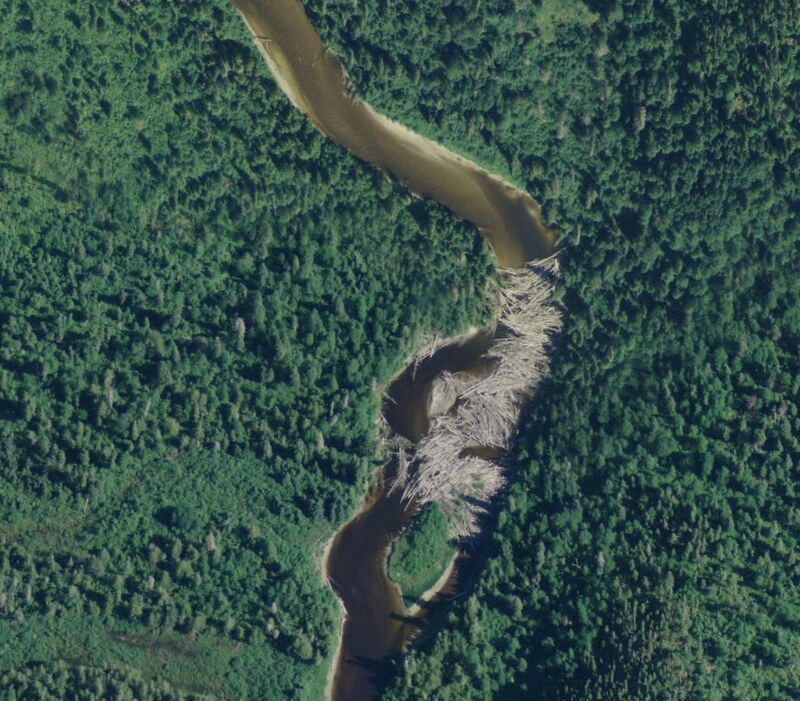 The pics below shows the north side (river left) of the impressive gorge that runs the length of the portage. Instead of bushwhacking a bit upriver, we headed off for the next portage which would take us out of Bad Medicine and into Ratte Lake. The take-out is on a sandy beach on river left; 265 meters later we were at the other end. Shortly afterward we paddled by a cow moose and her calf as we approached Ratte lake. 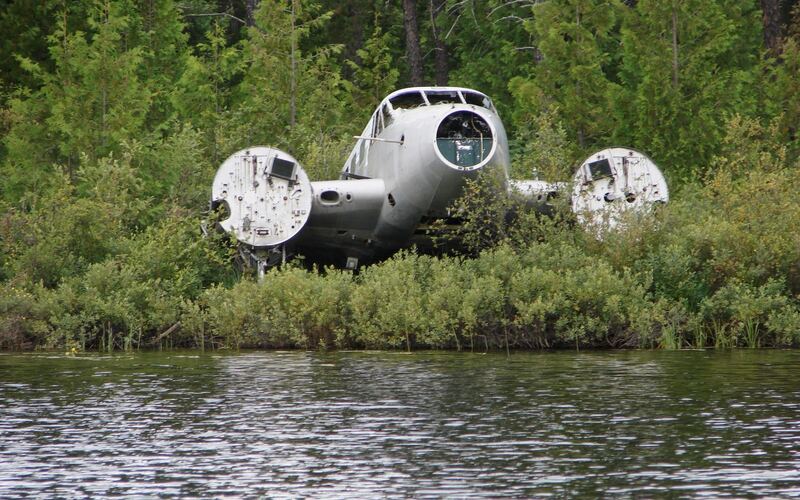 The aircraft on Wash Lake is a Beechcraft 18 on wheels. About 40 years ago it was flying south from Fort Hope (on the Albany) to Thunder Bay when one of its engines quit. The pilot belly landed on Wash Lake and the aircraft floated while the pilot and all passengers go out. Everyone was rescued and the airplane was pulled up on shore. The company that owned the airplane salvaged the engines and some parts at the time. About 15 years ago another group went in and salvaged the wings for another aircraft that was being rebuilt. On river right about 1.5 kilometers SE of the airplane comes the portage out of Wash and into Derraugh Lake. It is a 150-meter carry. Our map indicated a campsite at the put-in but we weren’t seeing anything that resembled a place to put our tent for the night so we headed down Derraugh Lake. We stopped twenty minutes later at the site indicated on the map above. With a bit of trimming, sawing, and rearranging we created a nicely sheltered spot tucked into the bush with a sloping rock face patio. You can barely see the tent and tarp behind the canoe in the pic below. With the chores done, we’re getting ready for a cup of coffee! Derraugh Lake Campsite – definitely tucked away! distance: 10 km. over three and a half hours – with half of that for the portage! portages: 1 – 1400 m.
We paddled to the end of Derraugh Lake and looked for the portage take-out. 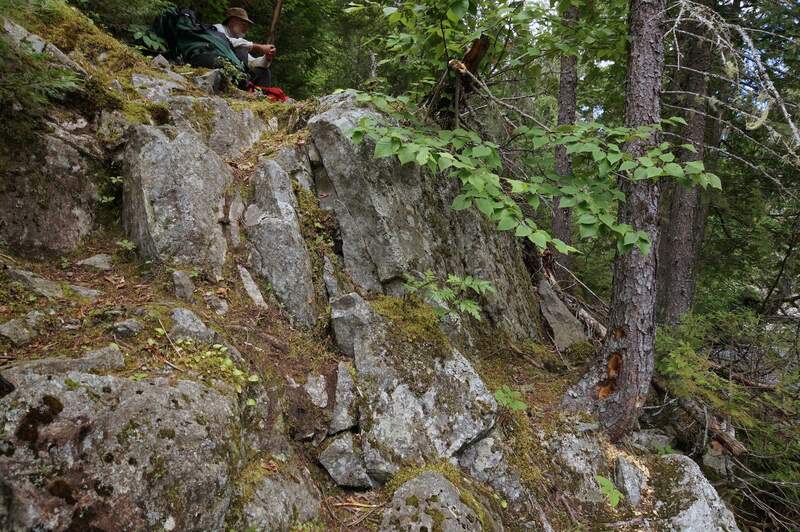 We were in the general area where prospectors had located a 200-meter gold-bearing quartz vein in the mid-1930’s. In fact, it had been a J.E. Derraugh, then the vice-president and manager of Jedder Gold Mines Ltd., who had made the discovery. Nothing ever became of what they hoped would be another Red Lake gold strike but now we do have a Derraugh Lake. One wonders what the previous – i.e. Ojibwe – name for the lake would have been. In some cases, we have reverted to the older Ojibwa names – for example, before the 1930’s the Pikitigushi River was still known as Mud River and Pikitigushi Lake as Round Lake. The two lakes on this stretch that I am most curious about are Cliff Lake and Bad Medicine Lake – their Ojibwe names might reveal something about their significance to those who used to paddle these waters. Perhaps their English names are just translations of their previous Anishinaabe ones? Just to the west of Derraugh Lake are two small lakes – one named Haile and the other Selassie – like Derraugh Lake also given their names in the 1930’s when the Ethiopian Emperor embraced his moment of statesmanship on the world stage – but before he became Bob Marley’s Jah Rastafari! 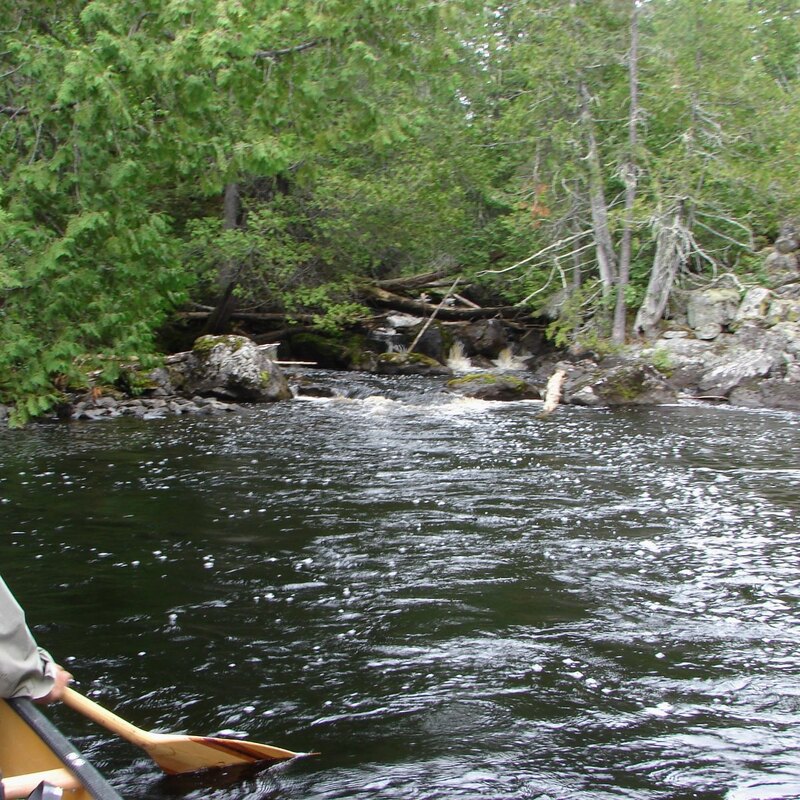 Back to the Gooseneck Rapids portage – an hour and a half later, by a unanimous decision, the Trip Highlights Committee had awarded it the prize for “the most poorly maintained portage”. Finding it was problem #1 – it was a bit further up from the rapids on river right than we thought it would be. Our portage routine has Max take two packs right to the other end and then come back halfway for the other two that I have dropped off while I go back for the canoe. I still have no idea how he was able to sniff a trail all the way to Pikitigushi Lake out of the dense bush we walked through! In fact, after I dropped off the packs and went back for the canoe I ended up getting lost as I tried to redo the “trail” I had just walked twice! Long stretches were also quite mushy and we were happy to see the end of it. Given the state of the portage, we wondered what locals were doing to get up or down the river on this stretch. Perhaps staying on the river instead and lining their way down? 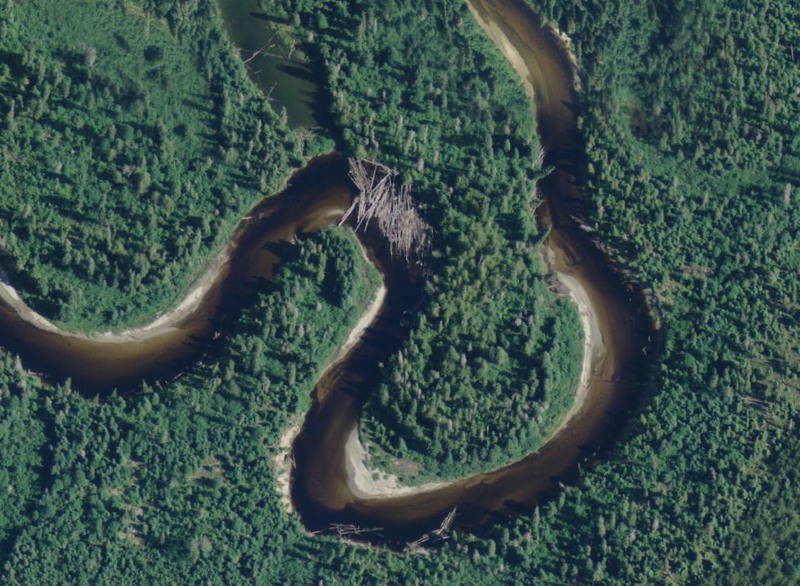 Looking at the Google satellite image below, maybe locals going up the river make use of the McKinley Road running up the west side of Pikitigushi Lake and put in somewhere above the rapids. Update: We walked this portage in July of 2013. 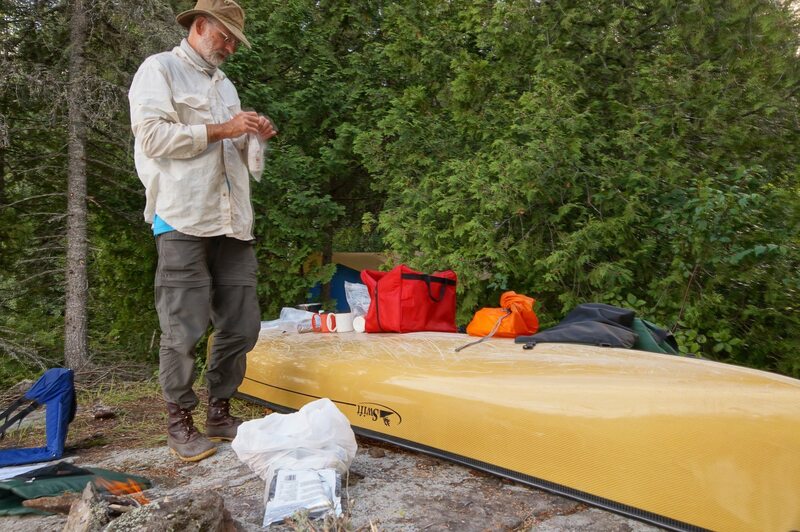 Since then, in August of 2014 to be exact, Phil Cotton and the Wabakimi Project Crew have given the portage some of their tender, lovin’ care – so the trail should be easier to follow for at least the next few years! 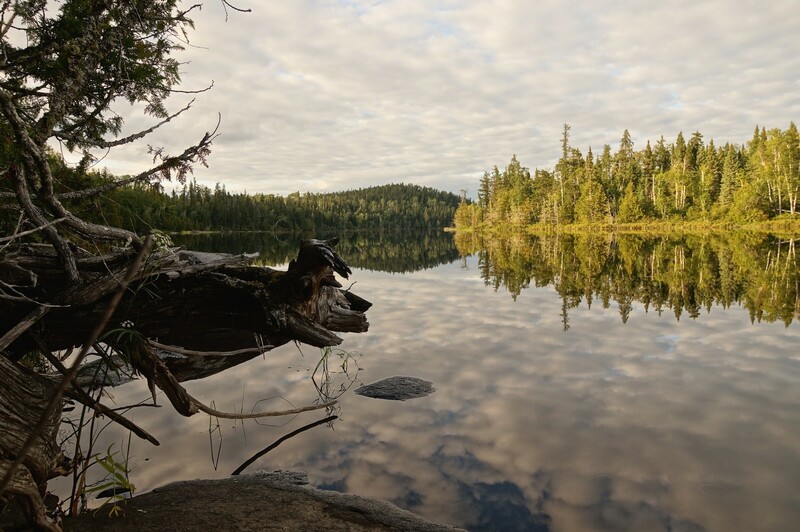 Once on the shores of Pikitigushi Lake, it was an easy paddle to the south end of the lake and then 4.5 kilometers down the river with the beginnings of the high sandy banks that undoubtedly gave it its first English name, Mud River. Not in the picture – for some reason we stopped taking pictures at this point! – is the Quonset Hut which the Bear Camp owners (the Boucher Bros.) make use of to store vehicles and equipment. We walked up a gravel road to the large clearing on the side of the road to Armstrong Station. Set up were maybe a half-dozen canvas tents on wooden platforms as well as a few trailers. We had arrived the day before the opening of the season’s bear hunt and there was a bit of activity since the first of the guests had already arrived. This satellite image gives a clear idea of what it looks like. We briefly chatted with one of the Boucher brothers while we waited for our Mattice Lake Outfitters shuttle. Not too long after we arrived, so did Annette Elliot and we were on our way. 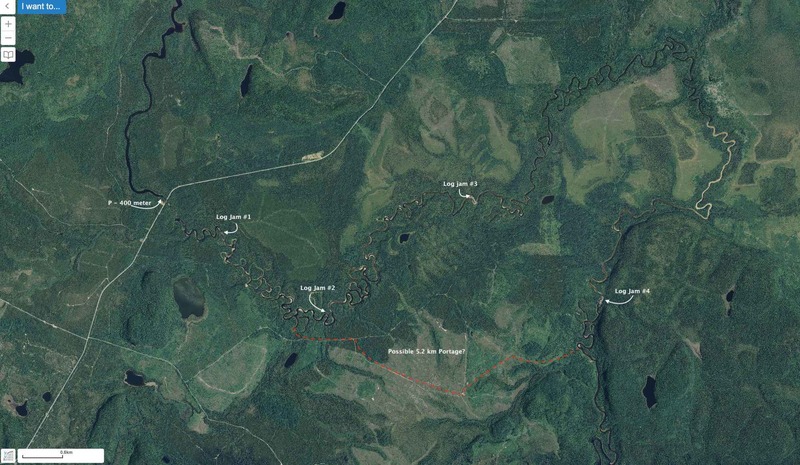 It is a little under 40 kilometers back to Armstrong Station from the take-out point at the Bear Camp. Another ten kilometers to Mattice Lake and we were back to where we had started our 17-day canoe trip around the northern perimeter of Wabakimi Provincial Park. 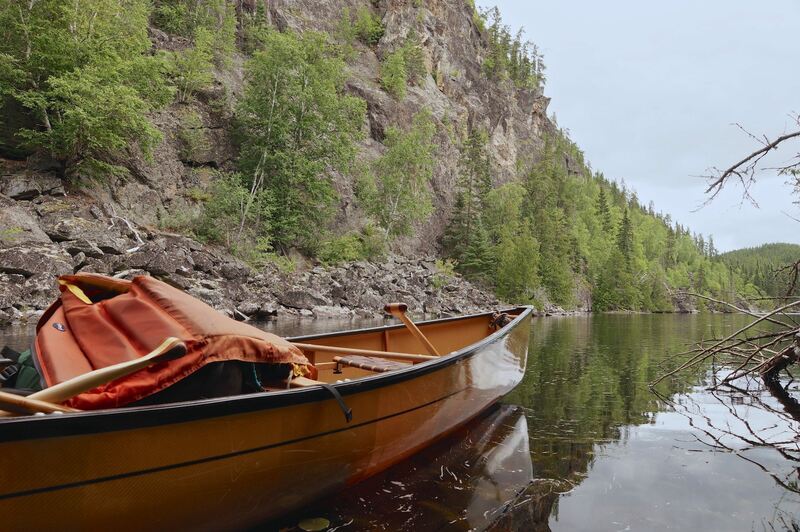 If you’d like to go back to the start of what was a truly excellent adventure, the post Canoeing Wabakimi’s Misehkow River is where it begins. 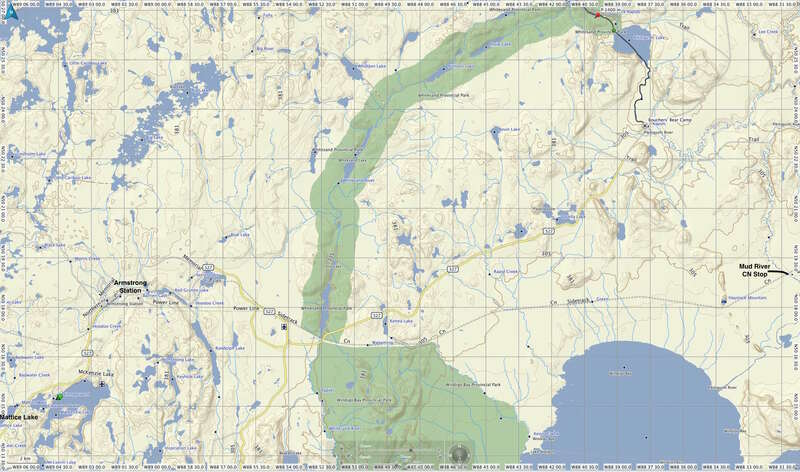 Not attempted, but still an intriguing possibility, for a future trip is the stretch of the Pikitigushi from the Bear Camp to Mud River on the CN rail line and then maybe all the way to Windigo Bay and Lake Nipigon. It looks like it would take a good day or two and it is difficult to say exactly what you’d deal with since information on rapids, log jams, and portages is pretty scarce. 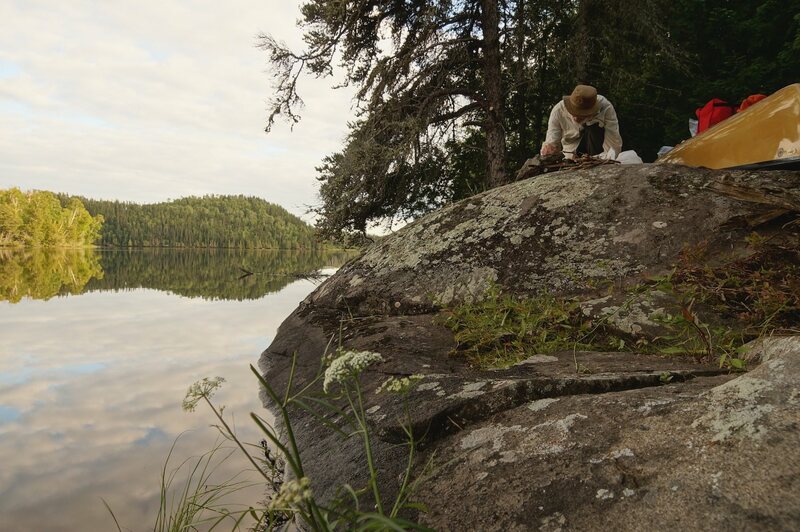 Update: In September of 2018 Max and I paddled the Pikitigushi from The Bear Camp down to Windigo Bay and then across Lake Nipigon to Undercliff Island and Echo Rock. The river section took us two days and was not difficult. 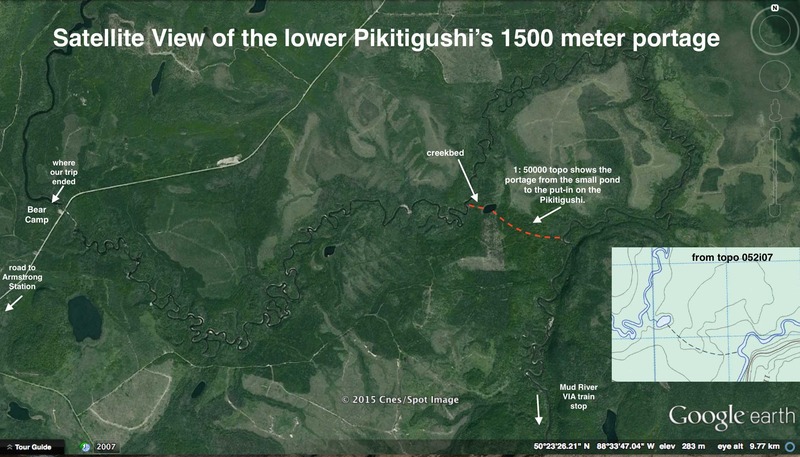 See this post –Down The Pikitigushi River From Cliff Lake To Lake Nipigon: From The Bear Camp To Windigo Bay – for maps and info. Before we decided to drive up to Mattice Lake, we had thought of taking the VIA train from Toronto to Armstrong Station for the start of the trip and then, at the end, waiting at the Mud River train stop for the eastbound VIA Canadian as it does its run from Vancouver back to Toronto. However, this time the convenience of having our own vehicle and not being bound to an exact extraction date won out over the luxury of not having to drive 4000 kilometers! Next time the calculations may lead to a different conclusion. 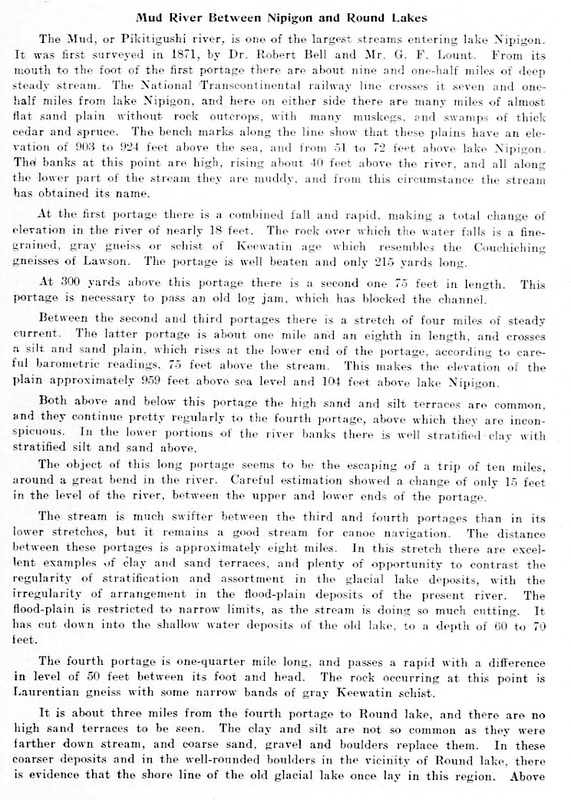 A bit more research led to a provincial government report by Ontario’s Department of Mines from 1909 (see here for the full text) which describes in greater detail the portages mentioned in the above quote. 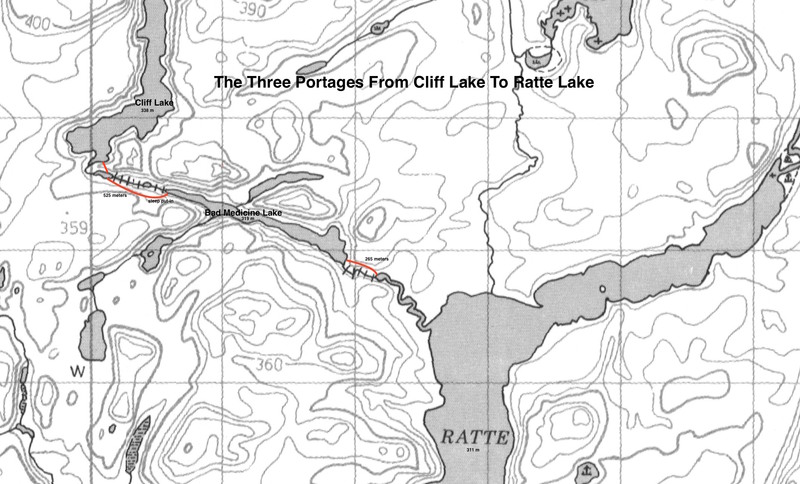 The longest portage (referred to as the third portage and the long portage in the above 1909 document) would be one which eliminates about fifteen kilometers of potential trouble. In exchange, it looks like you’d get to do a 1500-meter carry over a trail I haven’t found any information on. 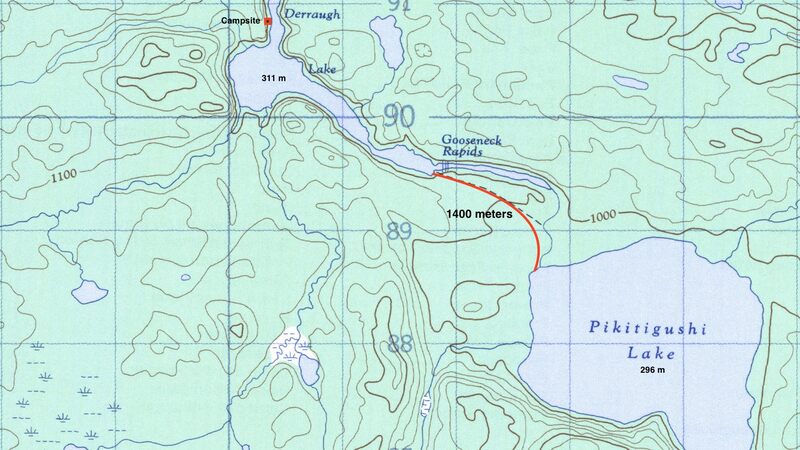 My Garmin Topo Canada map has a broken line marked in from the pond to the river; so does the Federal Government’s 052 I 07 Pikitigushi Lake topo map. The satellite image above shows significant clearcutting has occurred in the area contained within the big bend. A more in-depth look at the loss of forest cover over the decade from 2002 to 2012 can clearly be seen here. 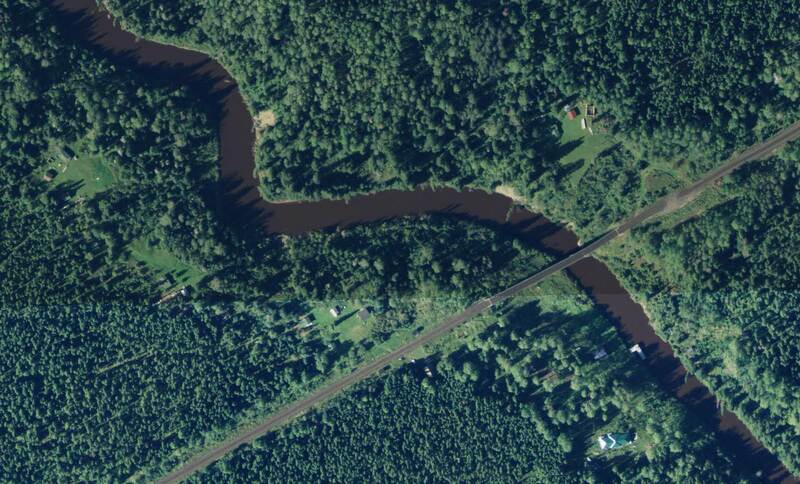 Assuming the Big Bend Portage is do-able, paddlers would then face one more set of rapids before coming to the VIA rail stop at Mud River. According to the 1909 Ontario Dept of Mines report, there is a drop of 5.5 meters (18′) from top to bottom. 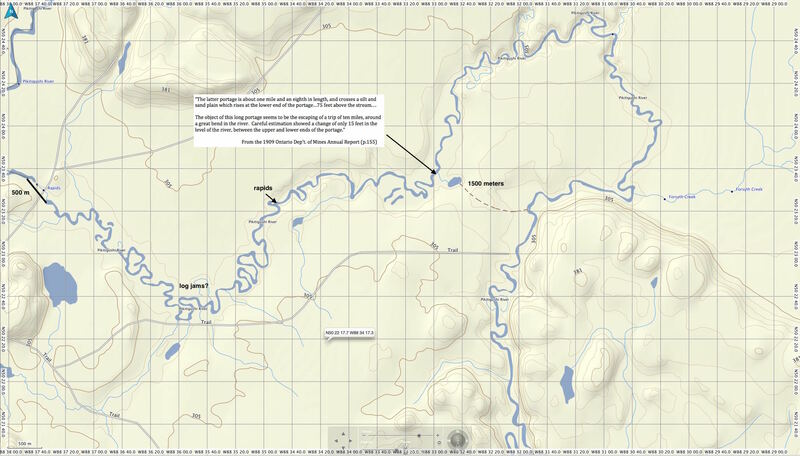 100 years ago there was apparently a “well beaten” 200-meter portage trail. 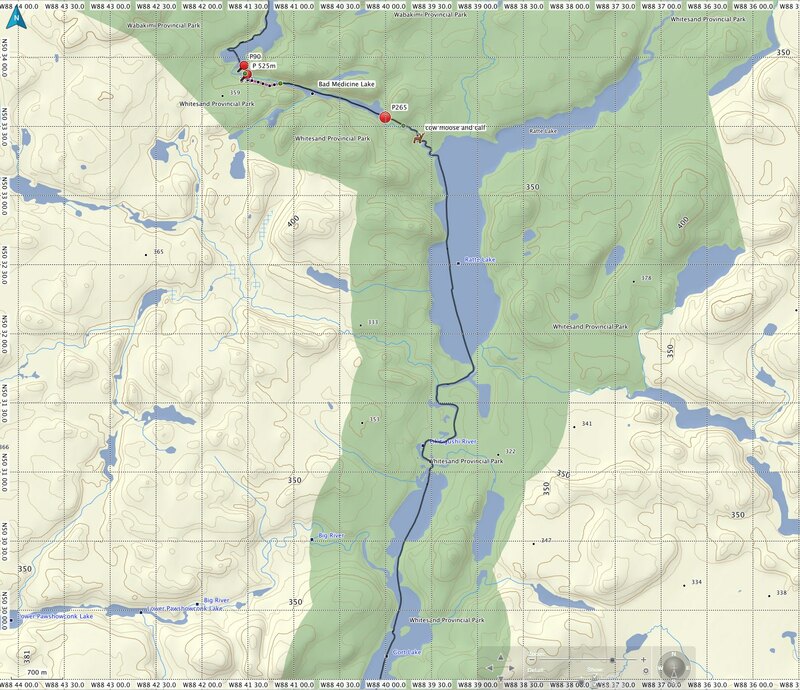 The 1:50000 topo 052 I 07 also indicates rapids/falls about 4.5 kilometers from the CN tracks. A closer look at recent satellite imagery has made things more clear. 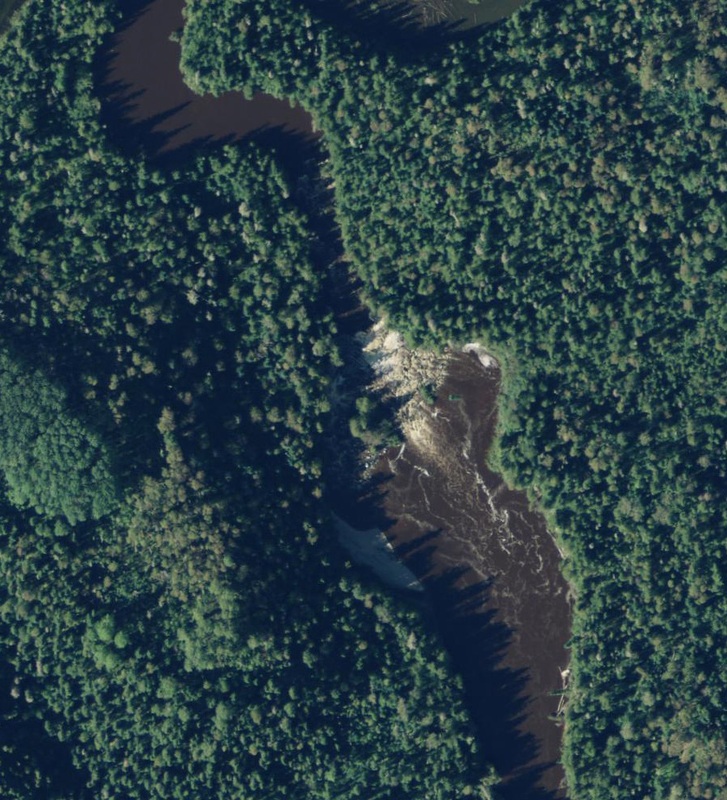 Instead of going to the usual Google satellite view, Rob Haslam’s comment on a Canadian Canoe Route forum thread of mine (see here) got me to look at the Bing satellite view and it definitely provides a better view. I also went to the Ontario Government’s Ministry of Natural Resources and Forestry website here for a look at its satellite imagery. 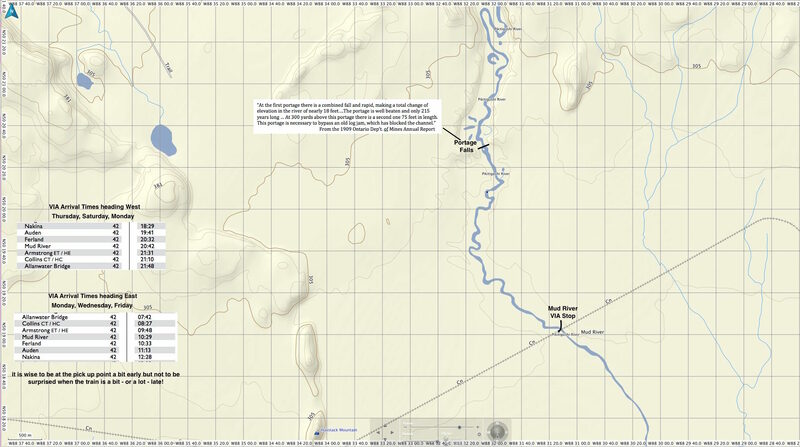 (You need to go into Map Layers – select Map Layers -and then unclick Topographic Data. You are then left with the satellite image.) It is even a bit more revealing than the Bing view. See the overview image below for what the sat images show – in particular, the locations of the four logjams of varying length. 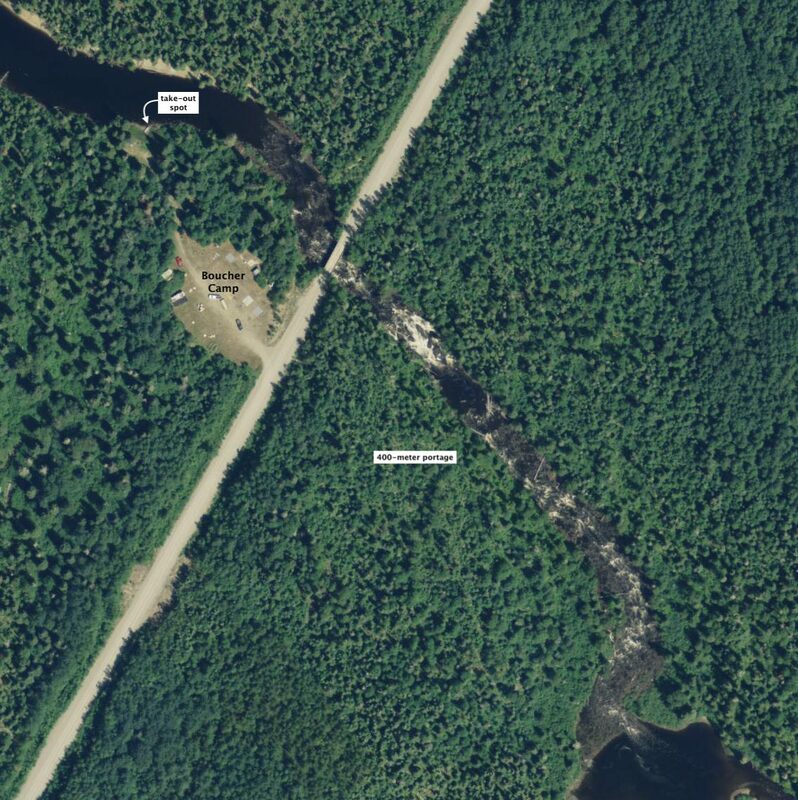 After the fourth logjam, there is one more visible obstacle – a set of rapids – before you get to the CN tracks and the VIA stop at Mud River. The one thing that does not show up – to no surprise – is the 1.5 km. portage. 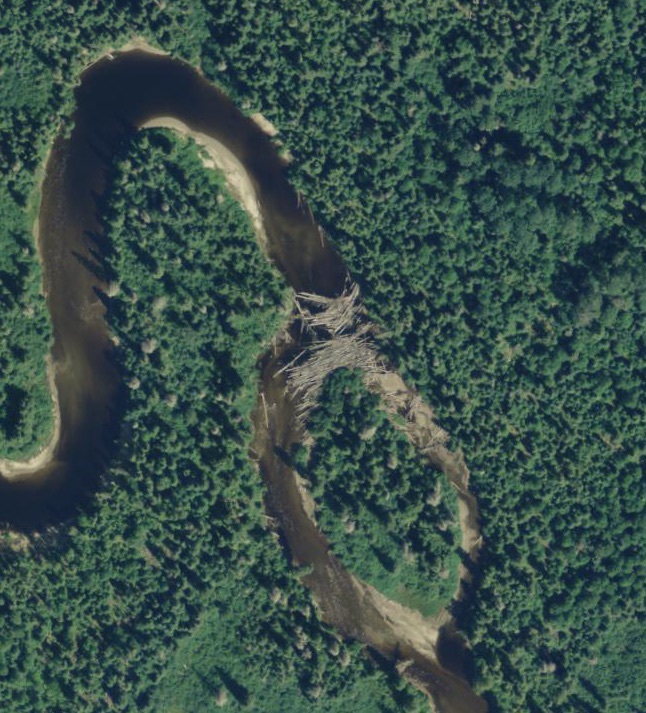 Given the likelihood that the portage no longer exists, a closer look at the satellite view shows visible minor logging roads and trails that might serve as a possible alternative portage. 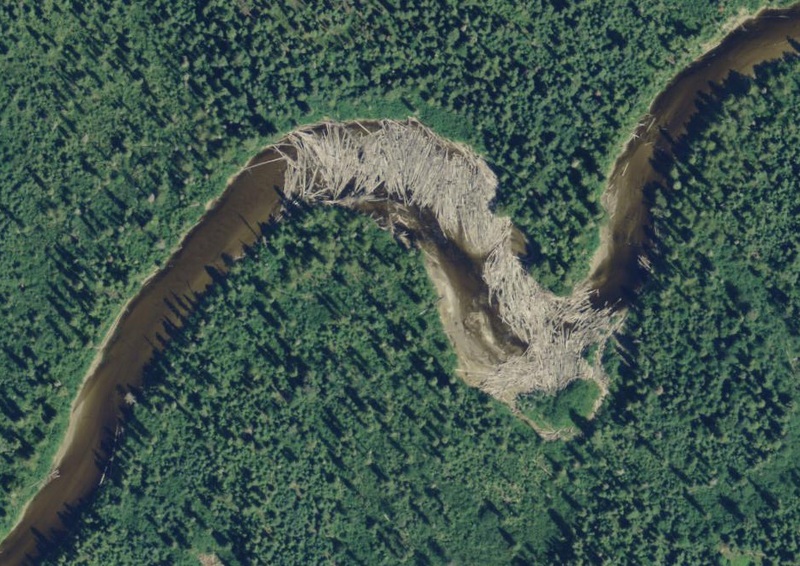 It would eliminate about 15 kilometers of travel on the meandering river as well as having to deal with three of the four log jams. 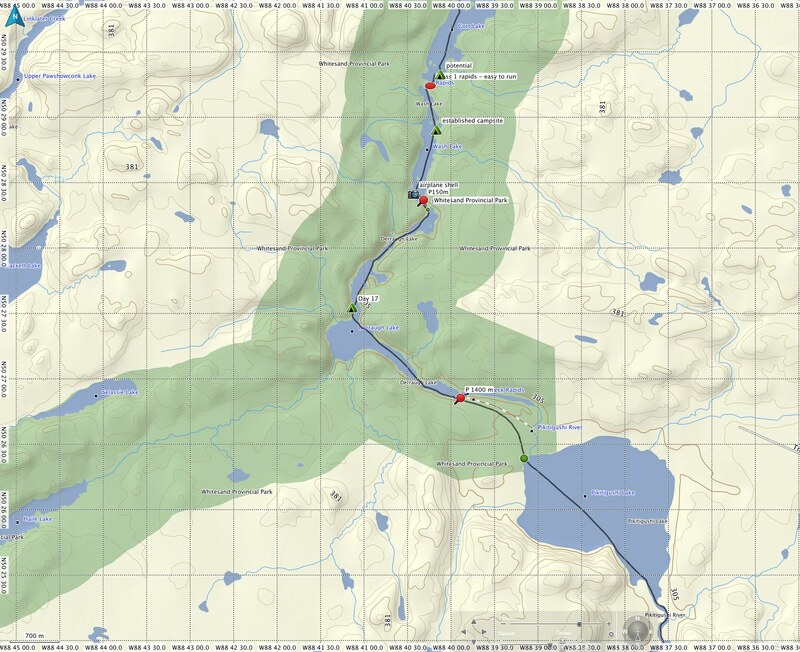 The beginning and end of the possible portage are a bit sketchy but the bulk of it looks like a network of trails. The only downside would be its length! At 5.2 kilometers it would be 3.7 kilometers longer than the historical once-upon-a-time portage! For what it is worth, here is the Garmin Topo Canada view of the area. Note the trail that corresponds roughly to the red line I marked off on the satellite image. It may be that someone will check it out – either driving up from Armstrong Station on the logging road or paddling as part of their trip down the Pikitigushi River from the Bear Camp or up from the Mud River VIA stop. Pikitigushi Lake 052 I 07. 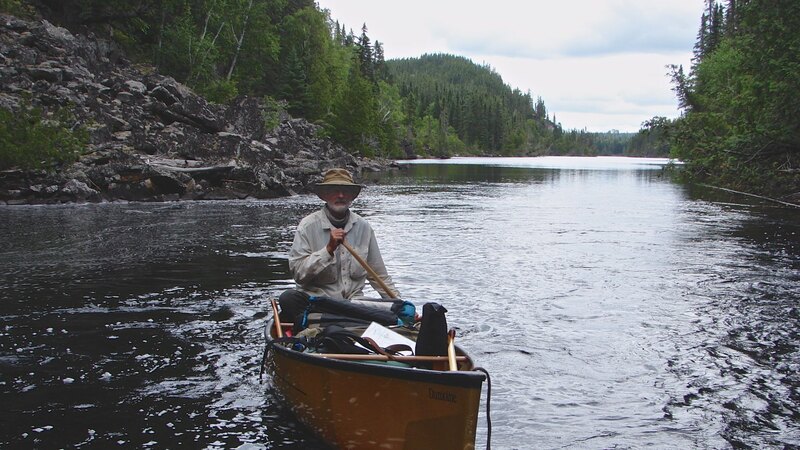 For another trip report – and lots of pix – on the section of the Pikitigushi from Cliff Lake to just before the logging road bridge, see the entries for Days 20 and 21 in CIIcanoe’s (aka Chuck Ryan) epic 21 Day Canoe Trip To The “Little North”. Finding his report online is what gave us the idea to take on the 350-kilometer route ourselves. We are really glad we did. 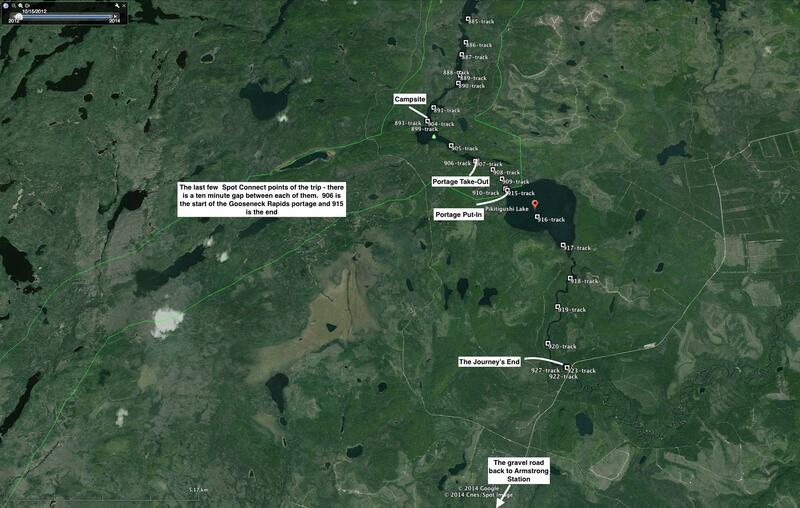 The VIA train only passes through Mud River three times a week either way during canoe tripping season. For the westbound VIA “The Canadian” train schedule see here – and here for the eastbound one. It would be necessary to purchase your ticket before you set off on your trip since it is no longer a flag stop. However, since it is a designated stop you do not need to know the mileage marker. Once we got up to Mattice Lake, Don and Annette Elliot of Mattice Lake Outfitters handled all of the logistics and park permits. We left the vehicle in their parking lot (totally safe) and flew up to the Misehkow River start point on one of their de Havilland Beavers. At the end of the trip, we were picked up at the Boucher Bear Camp on the Pikitigushi for the 50-kilometer ride back to our vehicle. I’d highly recommend MLO. They’ve been doing this for a while and know what they’re doing. They do have all sorts of other services that they offer – see here for the full list. 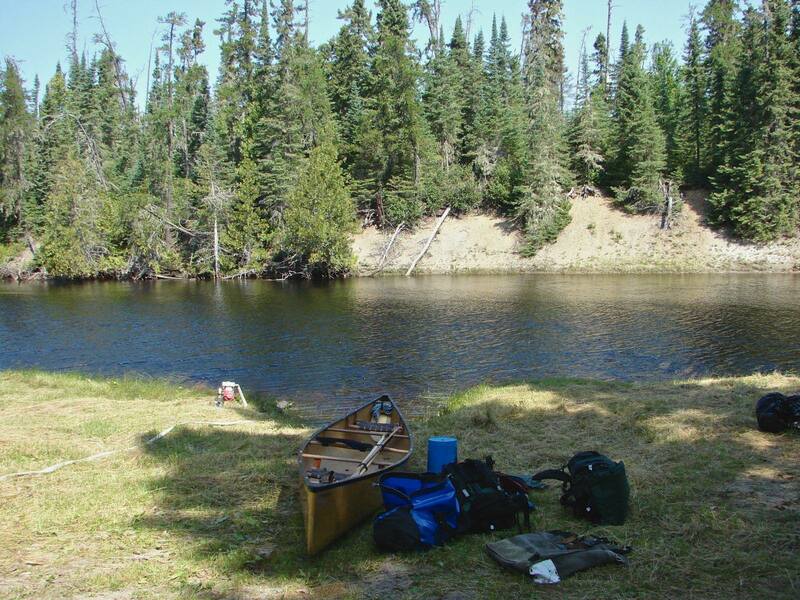 This entry was posted in wilderness canoe tripping and tagged Bad Medicine Lake portage, Boucher Bear Camp, Cliff Lake portage, Derraugh Lake portage, Gooseneck Rapids portage, Gort Lake airplane, Gort Lake canoe route, Mattie lake Outfitters shuttle, Mud River VIA stop, Ratte Lake canoe. Bookmark the permalink.